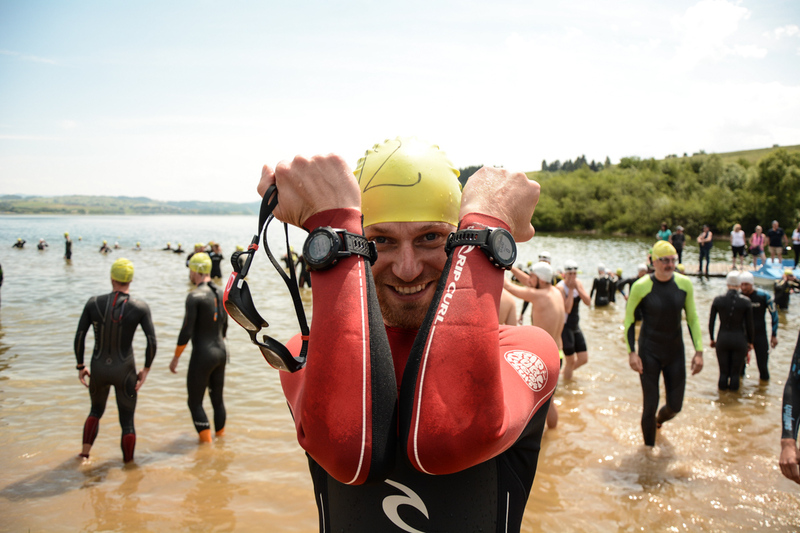 The term “Triathlon” takes on a slightly different meaning when accompanied by a catchy keyword “Ironman”. It certainly sounds interesting and mysterious. First time I came across the term was just a few years ago. Then I instantly got into it. I thought that since there are no impossible things, it might be quite an amazing thing to do, hopefully in not too distant future. 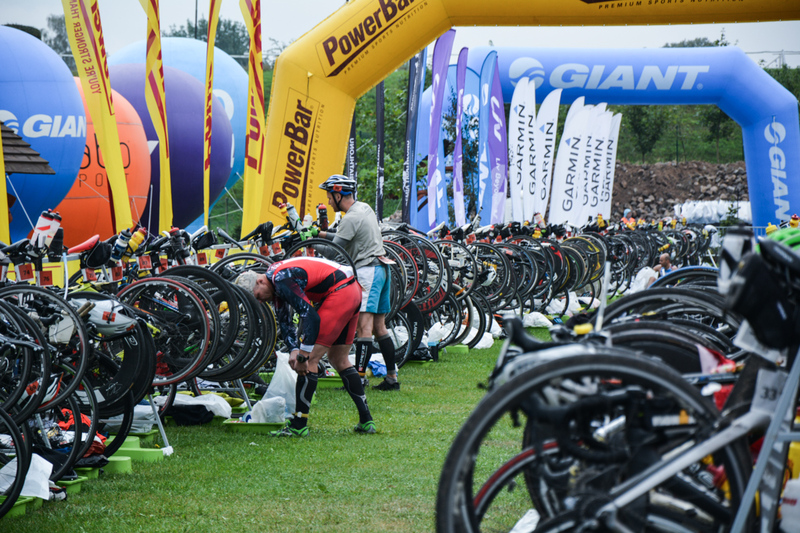 For those who have no idea what is it all about: the Ironman triathlon is a multi-sport event completed at a distance of 3.86 km of swimming, followed by 180 km cycling and 42.2 km running. 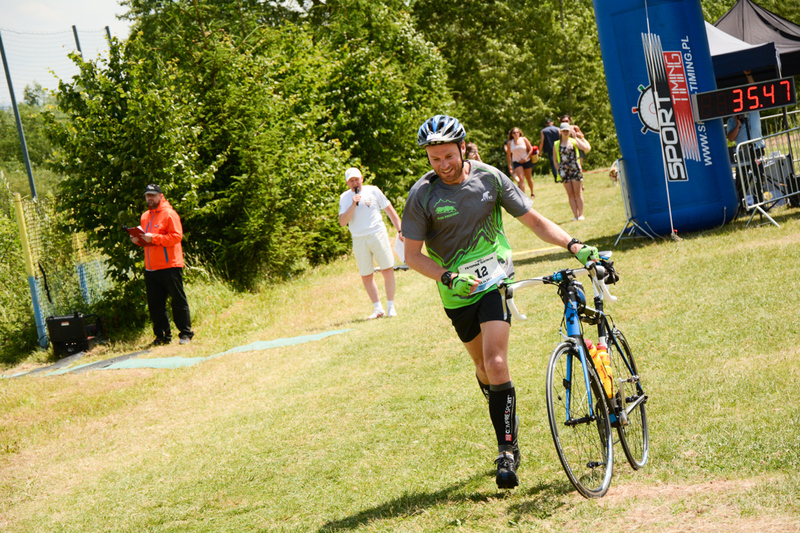 Finishing your dream triathlon is mainly a personal adventure that you need to create and go through. We start with the idea, go through the preparations and long training period up to reach the goal. In this post I would like to share some tips and thought for beginner triathletes who, just like me, dream big of completing Ironman distance. I hope my suggestions will be helpful regardless of your planned distance. Let’s do it in an easy informal way, together with very flexible training plan that will give you freedom to choose your goals. Looking at this sport at slightly different angle will hopefully result in good experiences and overall positive approach. The most important thing is that …. Completing the full distance for some time was one of my deepest. A dream that was kind of dormant, waiting for trigger to be activated. My initial (day 0) contact with each of the triathlon sports is quite regular trail running, occasional cycling and very irregular swimming. With triathlon as a combination of the three sports I had practically nothing to do except one-off informal event over a short distance completed a few years earlier. Nothing more. 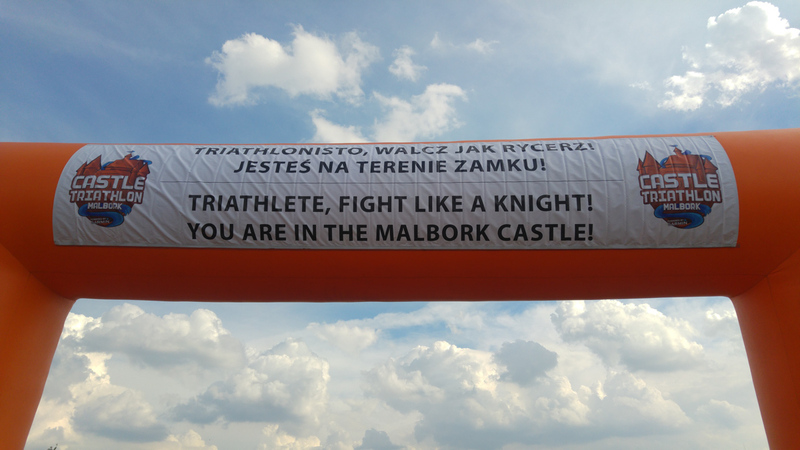 One day I heard about the Castle Triathlon, a full distance event taking in Malbork, Poland. 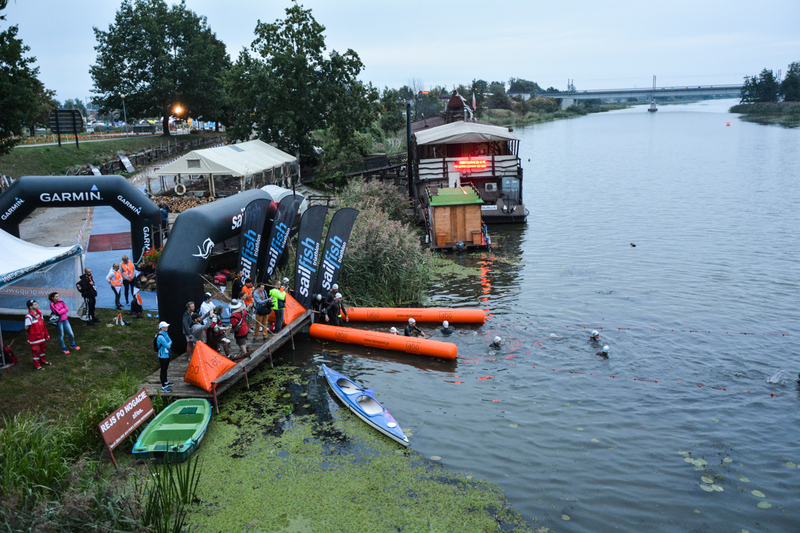 This is one of the very few Ironman distance triathlon competitions organized in Poland. For me it was just like a sign, so I did spontaneously sign up. The first step, that is signing up, is relatively an easy one. Especially when there is still nearly a year to prepare. The date of the competition is fixed, so no matter how far on the horizon, it should become a motivation for training. 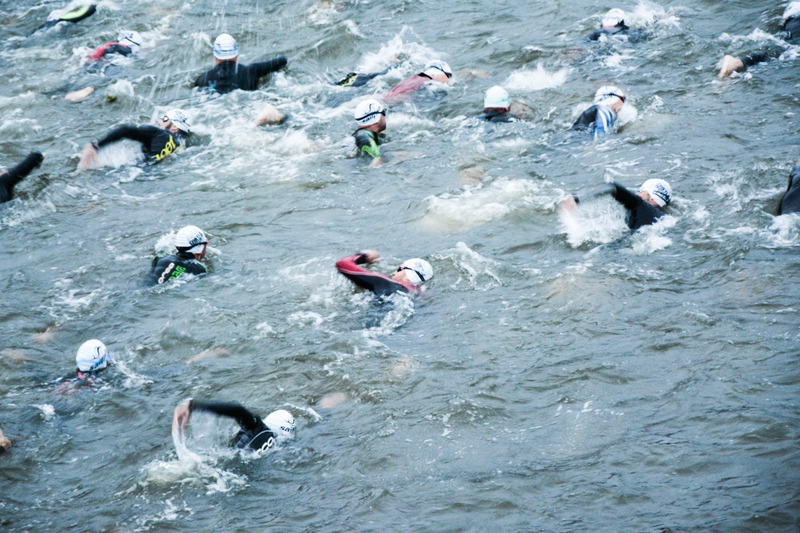 Swimming is probably the part of the triathlon that majority of people are most afraid of. I’m also part of group. The first problem I’ve identified is that I lack swimming technique. I also get tired very easily. I’m not able to swim a few lengths without making a stop. Not to mention completely not being able using the butterfly stroke. I’m assuming that when it comes to the race, most of the distance can be, just in case, finished using the breaststroke. To address some of the issues, I decided to have a few lessons with a swimming instructor. It proved to be one of the best ideas to start with and great success. It is very important to focus on technique details of each of the strokes. It helps a lot in eliminating obvious mistakes – and even worse – bad habits. The ability to swim with four styles is only half of the success. The second half is regular training. By regular I mean at least once a week – and every week. For beginners the effects appear very quickly. Sure, swimming can be practiced endlessly till perfection, but for me it was satisfactory to achieve a long-distance pace of around 2:00-2:30 min/100m, using freestyle 100% of the time. It is important that this is the rate at which easy breathing is maintained. 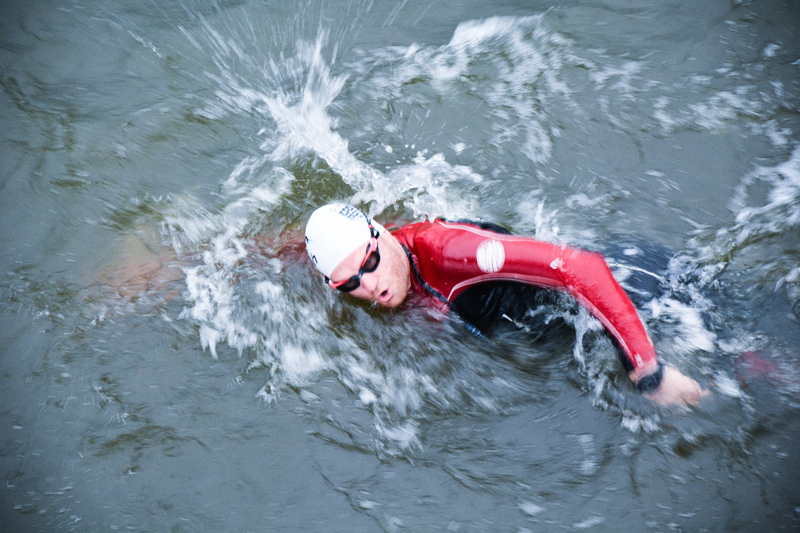 Swimming is the shortest leg of the Ironman. That means that no matter how hard you train, there is just a limited amount of upside benefit you can get. Probably many people (especially “triathlon nerds”) will not agree with me, but I think it’s enough to have this part under control and focus on the other two triathlon components: cycling and running. Another very important issue is training in conditions similar to those of the competition. If you don’t do it, you will be taken by surprise how it is in a ‘real life’. It is worth to buy an inflatable buoy that will provide extra level of safety during long open-water training alone. My dilemma, whether to buy a special triathlon wetsuit or keep my old, yet still running strong, surfing wetsuit, was solved after testing it. It is almost perfect for swimming! Whenever possible, try swimming in open water. Not only does it prepare muscles to the slightly different working rhythm, but it also allows you to train navigation and get familiar with the actual real-life conditions. Mastering navigation along the straight line will save you a lot of precious time. You also need to practice turning around the navigation buoys, dealing with cramps and getting familiar with other potential problems. Let’s go forward to the next part. I have to admit that over the last few years I have neglected bike. Apart from a few cycling trips (to Africa, Cuba and Israel) and occasional one-day projects, cycling has been put aside giving higher priority to trail running. The first encountered problem: I have never had SPD boots on my feet. Second problem: I do not have a road bicycle. The third problem: I’ve never ridden a road bike. Solution: I have to buy a road bike, put on SPD shoes and start riding. When buying the cheapest bike you risk losing the steering wheel or stretching the chain on the first uphill ride. Going to the other extreme, there is also no point in spending too much money on some crazy triathlon bike with aero gadgets and top-class equipment. At amateur level, a success is not in the amounts of money spent, but in the determination to achieve it. While the effects of training for the swimming part are satisfactory to me, I have not spent enough time on the bike. I would say that training 2-3 times a week for about 2-3 hours each time by far not enough to see the results. It’s enough, however, if you do not plan to score the podium. 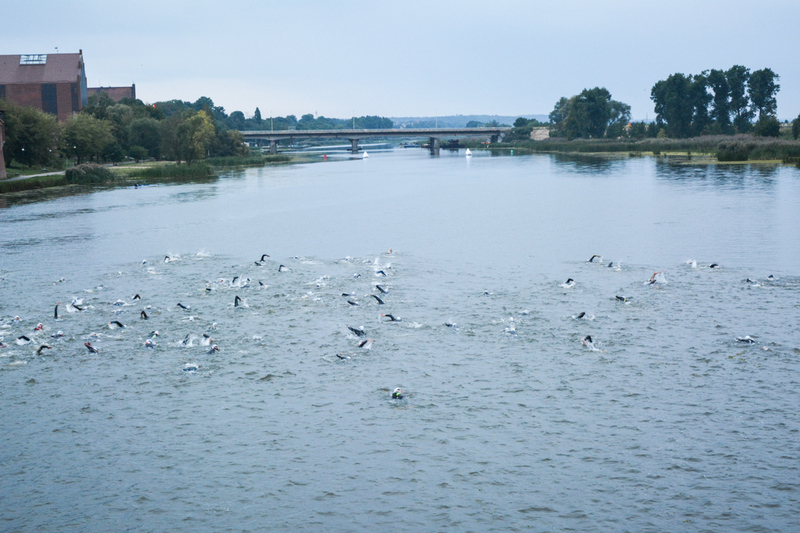 After a general test – cycling around the Bay of Szczecin (a loop of 250 km) in a single day I’m assuming that there is a bit of hope that the achievement could be repeated at slightly shorter distance, but following the swimming and before the marathon. Fortunately, at least one of the three sports I have partially under control. 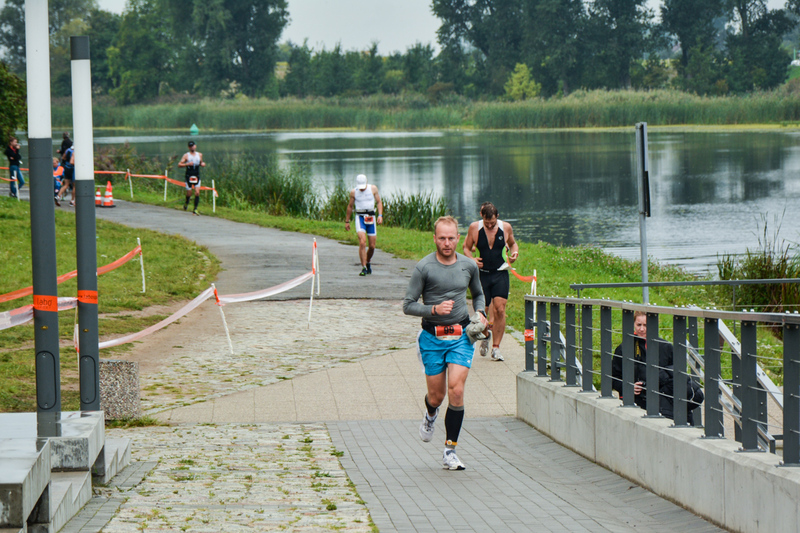 What’s the mystery is that whether the running stage will be just as simple even when it is to be completed after 3.86 km of swimming and 180 km of cycling. Will the legs not refuse to cooperate? Will there be any energy left? The key is to know your own body before it surprises you. Cross training is the best way to practice. At the early preparation stage, I recommend that you practice two different sports in one longer training session. Especially important is cycling followed by running. I do not wish anyone to experience the “rubber feet effect” during the race. It’s much better to know what it’s like while you are training. Get to know your body well so you can adjust the intensity of your cycling before switching to running. 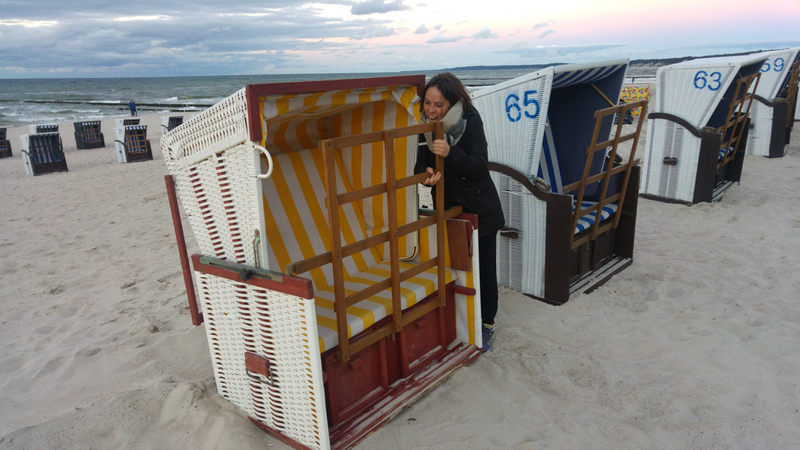 It is very important to perform several triathlon workouts. In the winter it means planning the logistics with swimming pool and bicycle. If you are fortunate enough to have a clean lake nearby, then it becomes much easier in the summer. Just make sure you have a handy spot to park your car, which will be a genuine simulation of T1 and T2 changing zones. 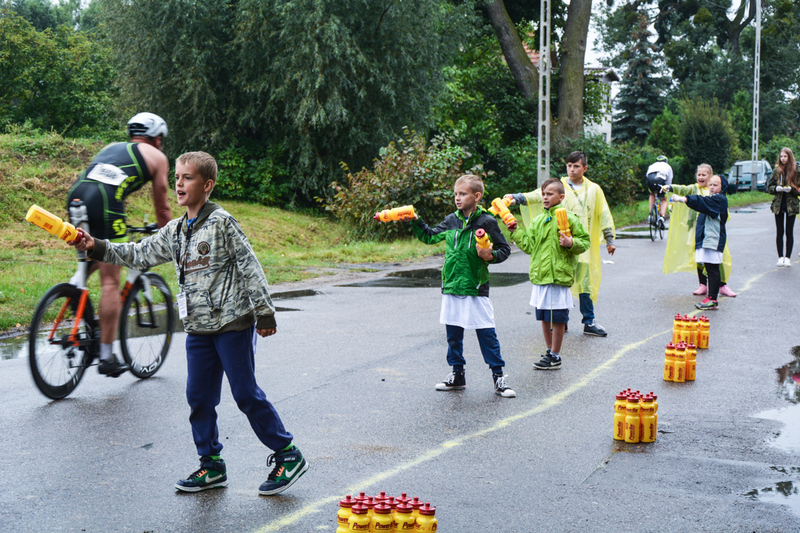 After leaving the lake and before running, it is necessary to practice the entire changing procedure in T1 and T2 zones. Step by step. Every little detail and the correct sequence of moves is important. 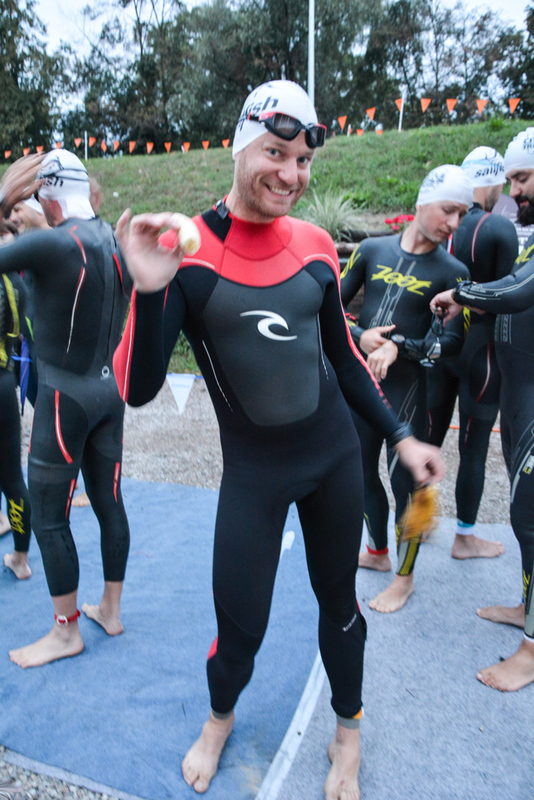 It seemed to me that, even though I am much less trained than professional triathletes, there is no big deal in changing shorts or putting on shoes. You can’t be more wrong! Everything needs to be practiced in close to real-life (race) conditions in order to act fast and to avoid unnecessary operations. Arbitrarily I assumed that one cross training per week is the minimum and two are the optimum. In addition, it is worth doing the entire triathlon 1 or 2 times per month. In addition to that, I tried to complete each of the sports alone at about 150% of the Ironman distance. When it comes to the three sports in a single run, for training purposes the longest distance I did was equivalent of 1/2 of Ironamn distance, that is 1900m / 90km / 21.1km. I’m not a big fan of strict training plans. The most fun and enthusiasm comes from the freedom that sport gives you and possibility to do everything they way you like it to be. Hence, I don’t stick to any rigid training standards beyond the ‘generally accepted’ and obvious foundations, such as reducing the intensity of training several weeks ahead of the race day or allowing enough time to recover after longer training. 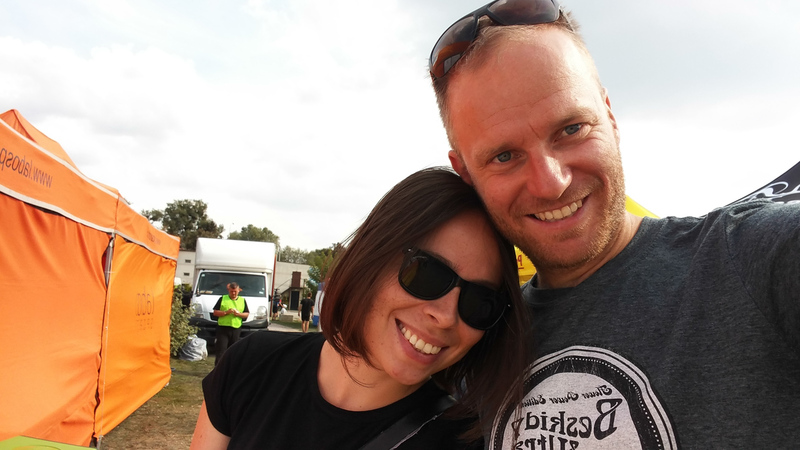 We are on the way to Malbork, a historical Polish town that is home to world’s biggest brick castle. 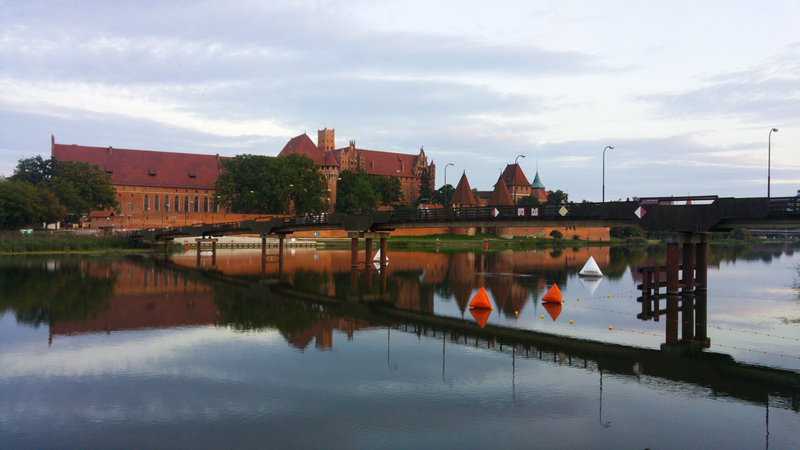 The triathlon will take place in the scenery of this Teutonic Castle. We arrive in the early afternoon one day ahead of the race. Just in time to join for a bike training session along official loop, then to attend a pasta party followed by an informational meeting. We have enough time to enjoy the place, have a hearty meal, check the equipment and prepare mentally. This element of preparation is also very important. Debuting at full distance is not only an demanding sport challenge, it is also a similar challenge to your mind. Race day comes. I wake up few minutes before five in the morning. 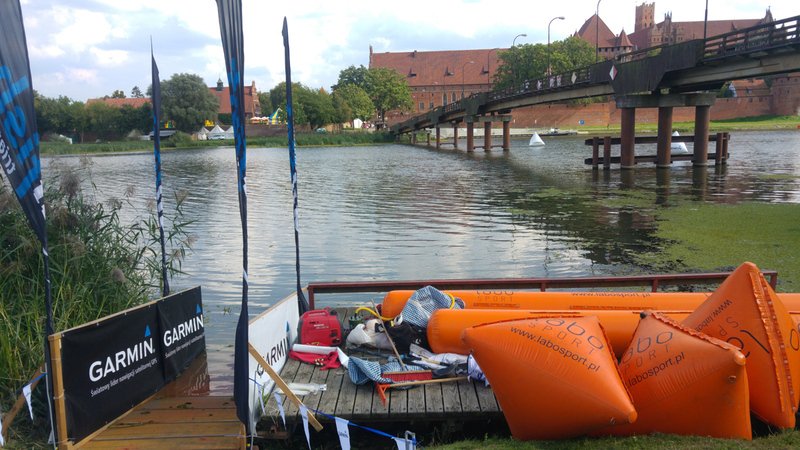 Just in time to do the final check of equipment, put on a wetsuit and show up at the bank of river Nogat beside the Teutonic castle. At six in the morning, a powerful cannon shot marks an official start. We are about to complete 4 swimming loops of 950 meters each. My first mistake is that I’m swimming too fast. All that rush and being inside crowd of swimmers is causing heart rate to raise above standard levels. It is getting even higher when navigating around the buoys or during accidental contact with other swimmers. During the second loop, I have a strong and abrupt cramp on my calf. It is so powerful that I start to realize that I may have to withdraw from the race. I clenched my teeth, get some extra patience and I tell myself that this time it is not going to happen. I will not give up so easily. I manage to wait it through and continue, back on a decent pace. Having finished these 4 loops and being out of the water I realized that the worst was over for me. It was the swimming part that was the biggest unknown. 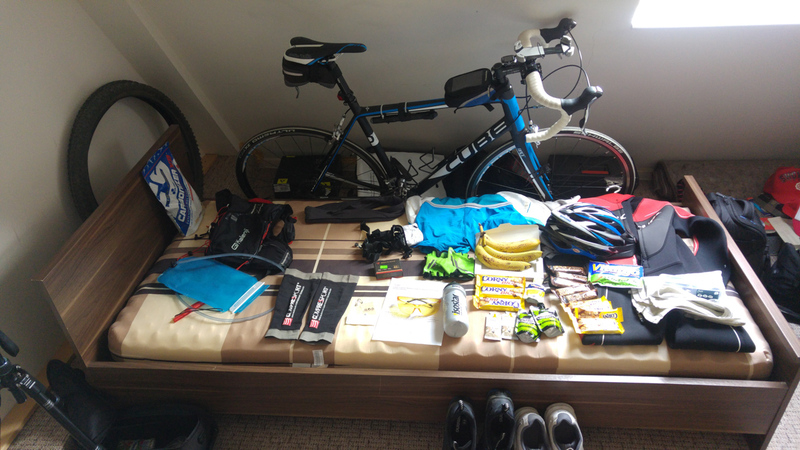 Trying to complete full Ironman distance while eating only energy gels and bars is a way to self-destruction. 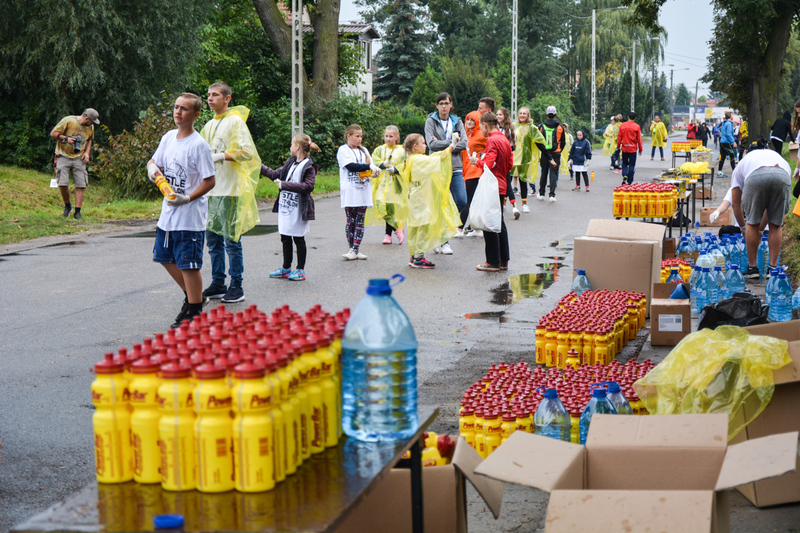 Be sure to check the menu of the food buffets before the race and stock up on a bit of variety. My usual strategy for trail running is, among other things, having a pack of dried sausages in a backpack. The other triathletes may have their aero costumes and fashionable helmets, but you have your snacks and it will make them all jealous. A bit in the rain, through the puddles and slippery roads, but eventually I managed to maintain an average speed of slightly over 26 km/h for the entire 180km. Most of the participants have already finished, but that does not affect my enthusiasm. I would say more: It feels great, because there only left a marathon to run. Peanuts, isn’t it? 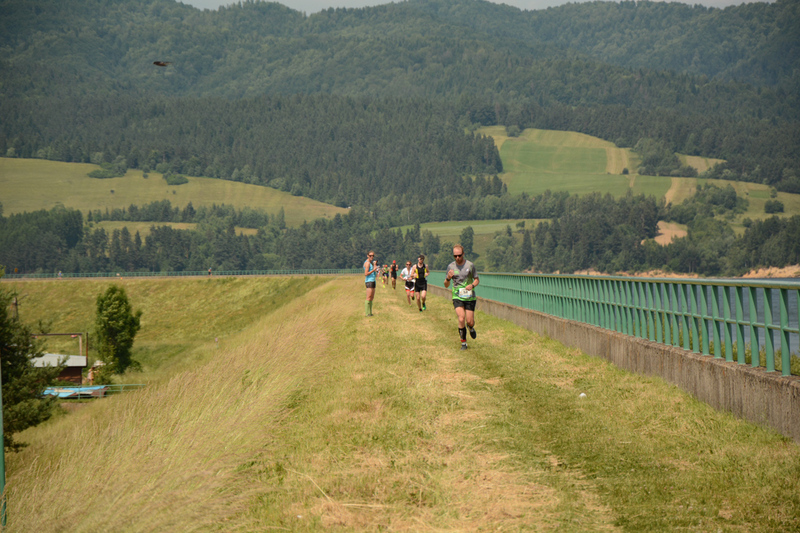 The running part consists of 6 loops roughly 7 km each. Usually when I hear about running in a loop I don’t see the point of it, but this time it is a bit different. 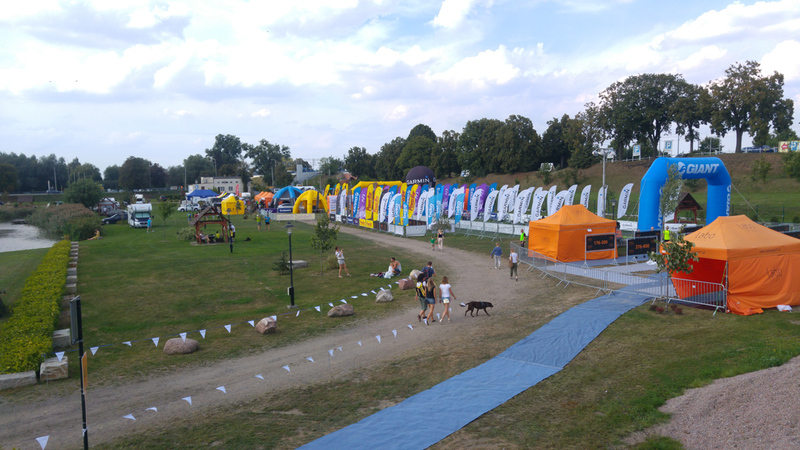 Each loop takes you along the fortification walls of the castle, then inside the courtyard, outside, across the river, around the race expo and back. At least there are things to look at and people cheering all the way. The rain has intensified and it keeps raining constantly over the final few hours. By the beginning of second half of the marathon my legs already ask to call it a day, but with this scenery, the castle, the knights and the vibe of the competition somehow I manage to keep moving forward. The run may be nice, but the pace is slowing down. Getting slower and at some point it is too slow to call it a run anymore. Eventually, the running leg of the competition becomes the slowest marathon in my life (around 4:44h). This totally slow ending has disappointed me, but it does not matter. 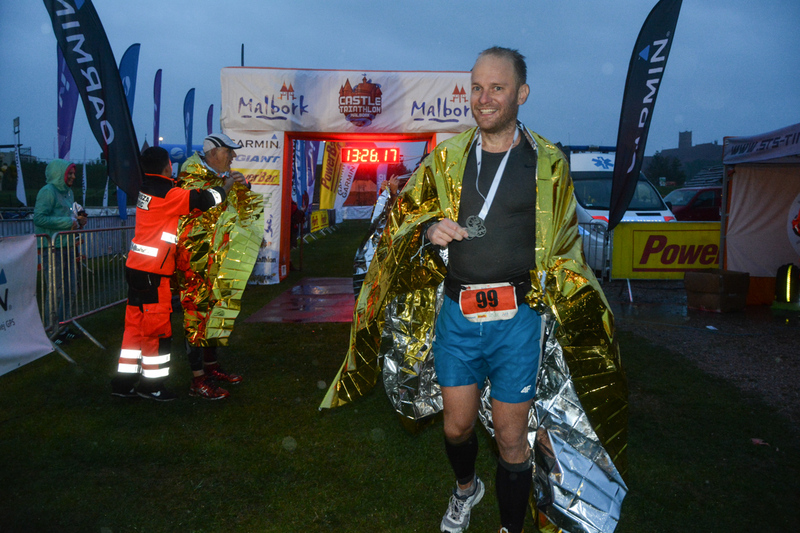 My total time of 13:26h is certainly not a world record, but what matter for me is that…. 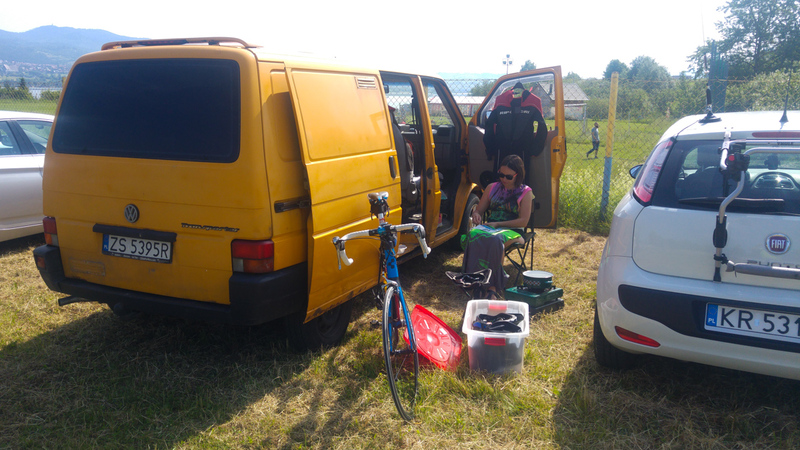 Now it is time to relax after triathlon….